SILVER SEAL Antibacterial Dishwasher Safe Mouse & Keyboard | OhGizmo! If you have small kids or work in an office where several people share your mouse and keyboard you are probably aware that the mouse and keyboard of most computers are hotbeds for germs and viruses. Seal Shield has a new mouse and keyboard called the SILVER SEAL that have antibacterial properties and can be washed in the dishwasher. 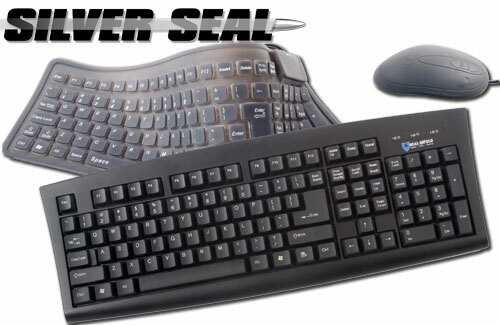 This is the ideal mouse and keyboard for use in medical settings since the silver ion is embedded into the plastic so the antibacterial properties don’t wear off over time. When it comes time to clean the mouse and keyboard of dirt and debris, they are both completely submergible and dishwasher safe. The SILVER SEAL mouse and keyboard will begin shipping in November at an undisclosed price. I don’t know how they compare with this plastic-embedded silver stuff, but copper alloys – such as your humble brass – have pretty good antibacterial properties too. Imagine the looks of solid brass keys, polished shiny from use! Okay, probably not dishwasher-safe, but I thought dishwashers were for toilet seats anyway. Back on topic, it looks like these will be $40 to $50 each.